This illustration shows the distribution of nearly 300 galaxies from the COSMOS field across the history of the Universe. The illustration is based on a photometric survey conducted with ESA's Herschel Space Observatory to identify a large number of starburst galaxies. 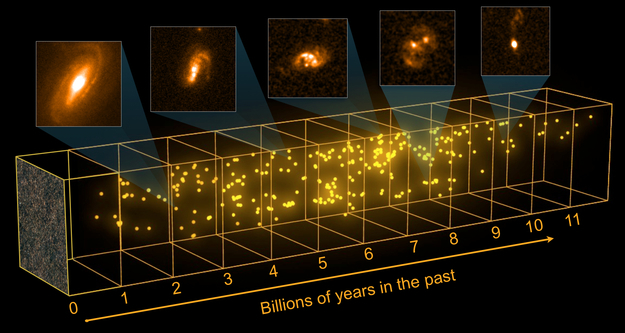 Follow-up observations with the W. M. Keck Observatory were used to measure the redshifts of the galaxies. On the left is an image of the COSMOS field – one of the fields used in the survey – as viewed with Herschel. The full census comprises 767 starburst galaxies with known redshifts and is based on observations of the following fields: Lockman Hole North, GOODS-North, ELAIS-N1, extended UKIDDS Ultra Deep Field, COSMOS, and extended Chandra Deep Field South. Five individual galaxies (as seen by the ESA/NASA Hubble Space Telescope) are shown as insets in the upper part of the image. The light from the nearest galaxy shown in the insets has been travelling towards us for 2.6 billion years, while for the furthest it has been travelling for 10.2 billion years.